The really great thing about living on a farm is nothing stays the same but change. It is change of season's , buildings going up or occasionally coming down, gardens growing and of course the annual increase in herd size aka kidding season. Each season has it's own way and often I find seasons within seasons. Today is probably the last day for awhile that Geoffrey will be able to work on my budding green house . Tomorrow is our day out to the Manton Apple Festival then followed by two days of rain. So he spent a bit of time working on it and getting in more winter wood our heat source during the winter. Working on the center beam for the gabled roof. There is a 2x4 on both sides of the larger post that support the beam . And here you have a few photos that show wind will not be a problem with this structure during our winter season or windy springtime. Each corner has a T-post sunk and wrapped with a flexible plastic over a wire core and it is tied to the horizontal post on either side and the metal center post of the original dog kennel. The photo below showing the door and side of the kennel also shows the smaller pieces of 2x4 that enforce the 2X4 on the of the top of the kennel wall photo above. Very excited about the coming week to see how this looks in the end. Have a great weekend and stop by again soon! MORE THEN WET WEATHER COMING. 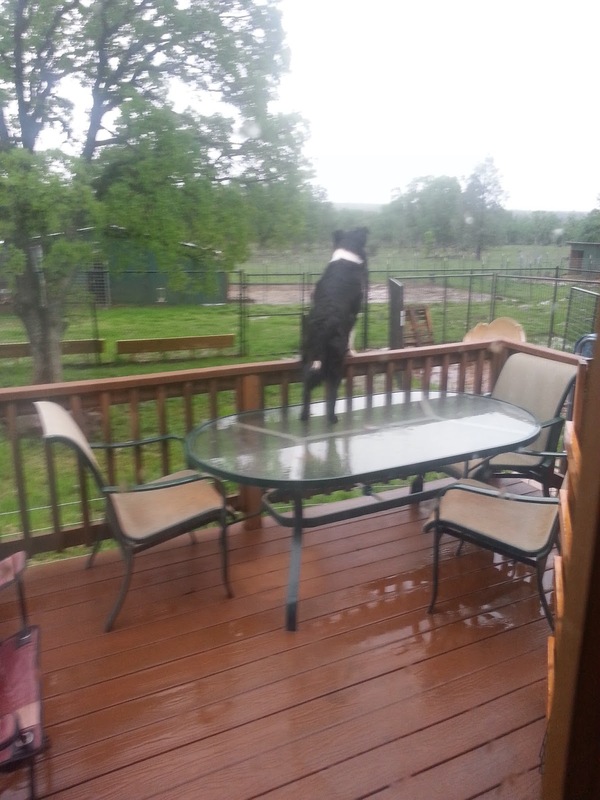 It is wet in this photo and Cali was taking full advantage of the view from the deck. Until I went out and spoiled her fun. We generally discourage dogs on the deck table or any table for that matter around here. But Border Collies tend to be very cat like and water like in that they seem to always seek their highest level. On Sunday October 2 we are expecting a 25 degree or more drop in temperature and a 60 % chance or better of rain. In California rain is still a big deal even if here in true Northern California we are no longer classified as in drought as the rest of the state is. We are officially "very dry". Looking forward to the rain on both Sunday and Monday. As in so many areas of our country October holds a multitude of offerings and seems to have every weekend packed with endless possibilities. The downside is one needs to limit their choices to one or two a weekend and perhaps catch the events next year you missed this year. On Saturday the 1st Geoffrey and I are going to a small community over the mountain from us for the yearly Manton Apple Festival. We have gone each year we have lived here except for last year when I was in Fresno on family business and a hay run. This year the festival is just before our 45th wedding anniversary and it will be a bit of a celebration. Perhaps we will come back with a couple of boxes of these beauties! on this event for about 20 years. And I am delighted to say I will finally succeed in my quest. 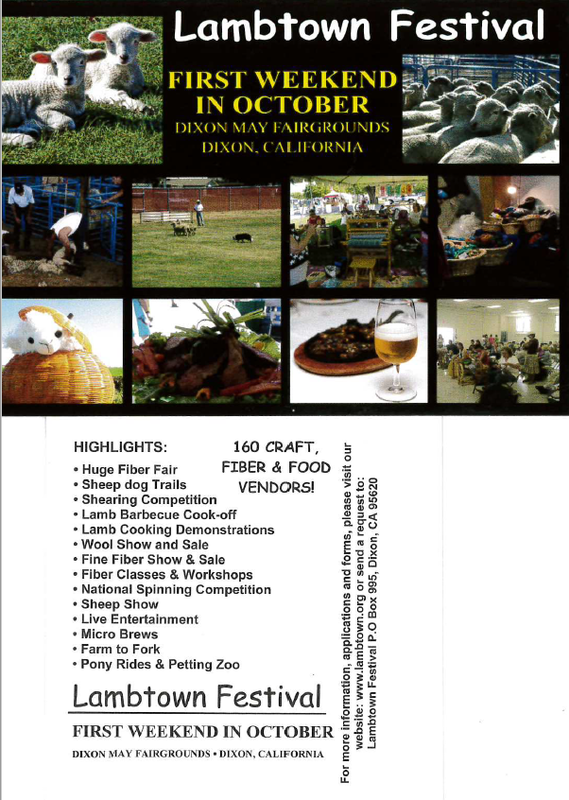 A wonderful day of fiber , food and livestock with Sheepdog Trails to round it out. There are many events such as this all over the states so treat yourself to one and you too may become a spinner, weaver, knitter or shepherdess. Two fiber events in a week is enough to make a fiber person giddy with delight and potentially coming home with more stash enhancements and cobwebs in the pocket book! But being adventurous and brave of heart I shall press on and return with photos to delight even the most reserved fiber person. But before the weekend sets in and steals my attention and camera I will do a brief update on the greenhouse. So don't forget to stop by tomorrow evening before you set off to enjoy this first weekend in October to see how it is growing! IT IS GETTING REALLY GREEN AROUND THE FARM! Remember this rather brown, rather dry looking piece of land? Check back to the last post for a refresher. As of today this is what it is beginning to look like. But this was this morning before milking and chores. Note Miss . Chloe at the top left corner basking in the safety of ignorance of what is to come. When I got my latest issue of Mother Earth News I noticed a reader submission on creating a green house by re purposing an abandoned dog kennel. Well my mind went into first gear. I have wanted a green house for a long time and this may make it happen! We will augment ours in a few ways. One is Geoffrey wants to put a gable roof on it instead of the usual hoop house look. It will be covered in the usual greenhouse plastic thickness dependent on what we determine for our needs.The walls of the greenhouse aka kennel will also be covered in the plastic and there will be vents two on each side that can be opened and closed as dictated by the weather and temperature. .I will also like some bling added. Practical bling in the shape and size of hanging pots outside the door as weather permits and a paver walk coming up to the door from a few feet out. Gee I could see going so far as to putting in a paver circle and adding a small table with chairs to have springtime and early summer coffee and enjoy both the green house and the small orchard nearby. A girl can dream that is the first step to making dreams happen isn't it? and this have in common? Stay tuned on Monday and we will share the answer. Have a wonderful first weekend of Autumn! Marshall, Hugo and Jack Sparrow leave home. Do these fellows look vaguely familiar ? I posted this to my teaser er coming attraction post a week ago. I can't believe a week has gone by the wayside already. Mostly because I was hoping to have completed at least two more post before the week was over. I need to have a talk with my personal secretary (namely myself) about my bad habit of booking more ventures then there is time to complete. But onward with a few more photos of the boys who grew up enough to leave home. When Marshall and Jack Sparrow were wee ones they were cute,loving and sweet. Marshall on the left and Jack on the right were the perfect Dam (Mama Libbie) raised kids. Friendly and easily handled. Then Meg gave us twins fraternal but physically almost identical. Hugo (or Thing 1 as he was known then) was of sweet disposition and became a favorite in the barn. Hugo on the right of the two strawberry blond kids , sister Thing 2 aka Patience on left. I work very hard to breed for lines that are strong in good confirmation and milk production. I breed my own replacement stock and have enough genetic diversity that I can line bred quite closely. But all the bucks aren't are not destined to be herd sires. I do attempt to place withers (bucks minus the buck parts) with folks who are familiar with goats and their care. 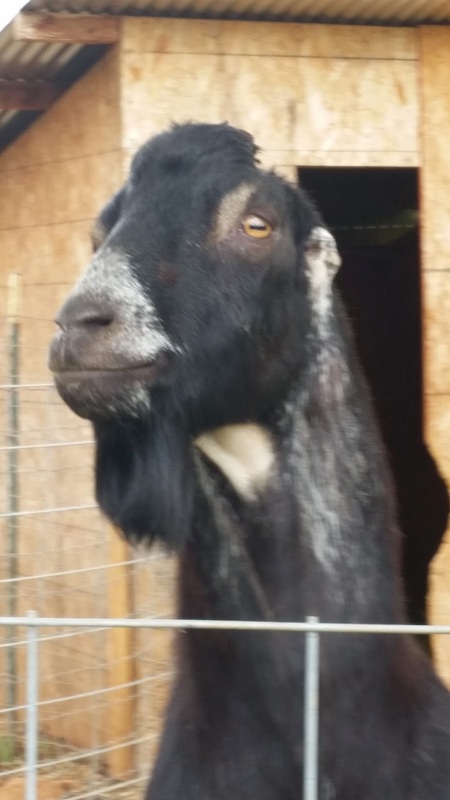 I have encountered too many goats in deplorable situations after being sold as "pets". I will say right now that some of my withers do get sold as butcher goats. In my mind a short humane life with a humane butcher is better then being torn to pieces tied to a post by the neighborhood dogs. Please excuse the graphic nature of that statement but in 31 years with goats I have seen the aftermath of that one too many times. But I digress. After some conversation with Debi it was decided that her farm would provide the perfect place for my three boys as companions to her aged wither pack goat. She loves goats, has the knowledge of their needs and they may someday hit the trail on one of the many trips she and her husband Brian make to the back country in the higher elevations. On Thursday September 8th the motley crew was loaded up into the extra large dog crate with a bale of alfalfa, large bag of peanuts (peanuts are the road to any goats heart) and made the 20 minute trip from Walnetto-Farm to Debi's small holding by the Sacramento River. Hugo on the left, Marshall center and Jack Sparrow on the right. We will miss you boys but know you are in good hands at your new home. For the moon refused to shine. For love they did pine. So she said, "I guess I'll go." Since April, January, June or July. PARDON ME DO YOU WEAVE? Part One. I went on a fiber adventure yesterday with a friend. We went to look at some Jacob fleeces a shepherdess about 30 minutes from us had from this years shearing. For those who don't know Jacob it is a breed of sheep. And the actual trip to buy these fleeces and the animals they come from is yet another blog post to come. But on the way over we stopped at a local Dutch Brothers coffee for some cooling Frappuccino's . As is the custom at Dutch Bros. the gal getting our drinks inquired how our day was going. So we shared that we were on a fiber adventure to purchase sheep fleece to weave. 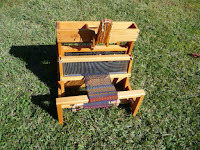 Of course we would weave it after we spun the fiber up on our spinning wheels. You are going to do what to get what to do what? Pretty much covered what she said about what we do. 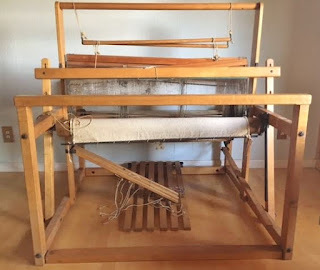 I have found it not unusual that folks either have no clue what spinning and weaving are or can't understand why in the name of everything sane would one go to all the trouble to undertake a process that one can go to the mall and buy and wear "instant gratification". Remember that phrase there will be an analogy latter. The loom to the left is my newest addition to my weaving tools. This is the fourth loom I have owned and I have two others currently. This is a JL Hammett counter balance loom . 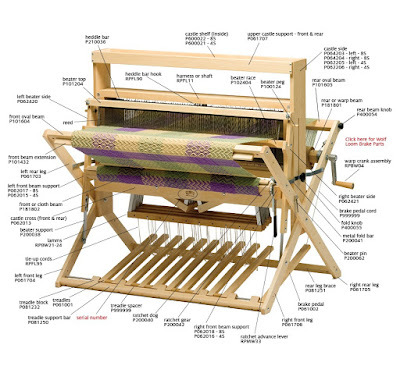 There are many types of looms and they are distinguished by how they look, how they operate and what they are used for. 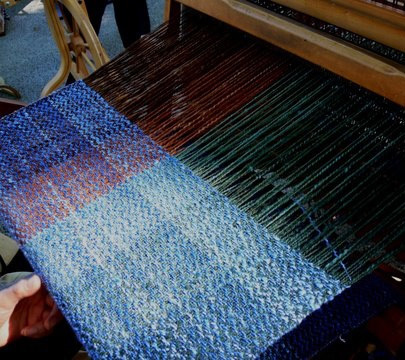 This loom is considered a floor loom*. Floor Loom* - Floor looms are best used for producing longer lengths of fabric, for production work, designs that are more complex and for carpets and rugs. The loom must be solid and stable without being excessively heavy. Three different types of floor looms are: Jack, Counterbalance, and Countermarch. 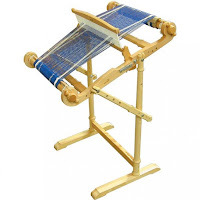 Table Looms - These smaller, less expensive, portable looms are usually jack looms. Sometimes they have springs under the shafts to hold them down. 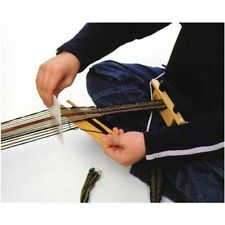 Table looms are good for learning as they are portable enough to put into a car or even on a plane to take to a workshop. Rigid Heddle - provide the equivalent of two-shaft weaving and can be adapted to behave as a four shaft loom by adding a second heddle set. 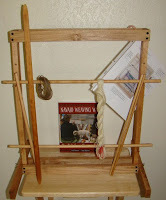 Tapestry Frame Loom - The tapestry frame loom is the most simple form for a weaving loom. 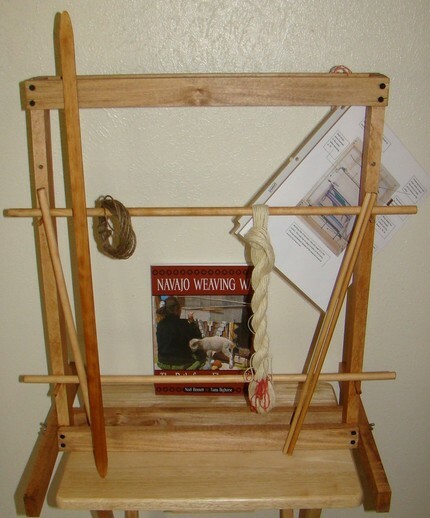 The Navajo loom would be considered a frame loom. Back strap loom - A simple loom comprising two sticks between which the warps are stretched. One bar is attached to a fixed object and the other to the weaver usually by means of a strap around the back. The above descriptions and photos were found on The Woolery at woolery.com just in case you get the weaving bug or other fiber art bug. And if any of you enjoy the inter workings of things here is a more detailed description. Remember that a jack loom works in a different manner the the counter balance and counter march. Stay tuned for part two . Where we will find out what is the difference in how the floor looms work. Coming To A Phone, Lap or Desk Top Near You! I hate to be a tease let us just call it coming attractions. This week coming to a phone, lap or desk top near you will be some fun blog post. One will be about this beauty. You may remember her from Home Again Jiggity Jig Part 2. And she was in parts for certain. Of course what would the week be without an update on Hugo, Marshall and Jack Sparrow and their big day out going to their new home? And last but never least a visit to Farmer's Market in Redding CA. The Shasta Growers Association put on quite an event every Saturday at the main market. So grab your popcorn or tea or coffee and check back soon. This is gonna be a very busy week at Walnetto Farm. "Cowgirl is an attitude. Cowgirl is a pioneer spirit, a special American brand of courage. The cowgirl faces life head on, lives by her own lights, and makes no excuses. Cowgirls take stands. They speak up . They defend the things they hold dear. 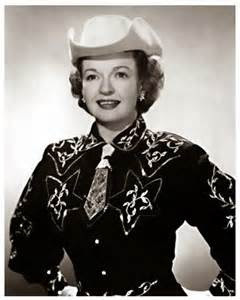 A cowgirl might be a rancher, or a barrel racer, or a bull rider , or an actress. But she's just as likely to be a checker at the local Winn-Dixie, a full-time mother, a banker , an attorney, or an astronaut." HOME AGAIN JIGGITY JIG PART 2. Another road. Life is full of them and yesterday I took a side trip to deliver the three wethers to their new home. That is worthy of a blog entry for another time in itself. But it took the starch out of me. After a fast three day trip to Fresno and then the unloading of loom (another blog entry in the future) plus the boys trip to new home I was pooped! So here I am today trying to make up for an empty promise. That part two of the Fresno trip would be up for your viewing pleasure. The road above is the road to my hay man's place in Fresno county "the golden west side" as we lovingly call the great agricultural expanse west of Hwy 99 . "Hey it is hay" pun intended. This lovely field is one of many that my hay man Brett grows in his alfalfa operation. It is a second year field and we have had three loads (two last year and one this year) from it. All cuttings were lovely and the dairy quality test* hay we got earlier this summer was from this field. The load I picked up on this trip was from another equally nice field in a different location. Loved the fact that Brett was flying our flags in his yard and asked for permission to take a photo to share on my blog. Wouldn't it be great if more people did the same thing? Hay picked up 25 bales on that day and another 35 are in storage on his property for me to pick up in October before autumn kicks in with some wet weather. Hauling and then unloading in the rain is no fun! unassembled. It is a 45 inch weaving width 1946 JL Hammett counter balance rug loom . The counter balance is in reference to the way the harnessses (shafts) which contain the heddles work. Another post of its own is loom anatomy. 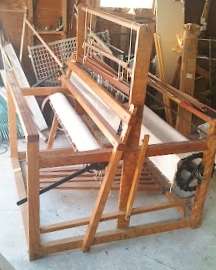 The photo below is my loom. Use your imagination please. I am very sure it will be quite lovely once it is put together and dressed. Which is weaver for having a warp on it and then let the weaving commence! Time to put some home made sour dough bread into the oven. I am planning on getting in a few post here between cheese and soap making in the coming week. Also working on getting my live feed on visitors back up as it went south yesterday. I love to see where everyone is viewing our post are from. So check back soon. PS Ah late to the party. I forgot about the asterisk above in the hay portion of my post. 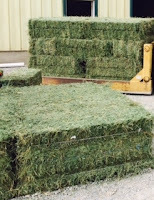 *look for the post about hay Heading Out Again for the explanation about test hay. The signage may tell you the road narrows but in the case of this particular road the horizon was widening. Once again on the way to a new adventure! Sunday morning I headed up Wildcat over the Butte down into the valley on the other side. Apologizes for both reflection in the windshield and the lack of clarity. We have a very large forest fire going in the Klamath forest on the California side. On this morning the smoke was beginning to come down to our area about 3 hours south of the fire area. I pressed on to wind my way down the mountain on Manton road then to Hwy. 36 to Red Bluff and old highway 99. The old state highway provides a lovely drive at a leisurely pace if one has the time to allow for it. Eventually one catches up to I5 just before entering the Sacramento area. Passed the time listening to Bluegrass and Willie's Roadhouse on Sirius radio. Was feeling a bit empty about early afternoon so stopped at a place that had caught my eye several trips back but never warranted a stop at the time . A really homey interior with home made jams, jellies and baked goods. A nice offering of country accent pieces for sale and a few came close to ending up in my truck but not that day maybe another trip. What did end up in my truck was this beauty. A freshly baked peach turnover . Oddles of peach pie filling with flaky crust to die for. Just the right amount of glaze over the top. Added a lemon sweet tea and it was heaven. Then it was back the truck turning south onto Highway 99 heading toward the I5 junction and in about 4 hours more landing at a friends house in Madera county just a few miles north of Fresno off Hwy 41. The clock hit 5:30 in the late afternoon as I pulled into their driveway and began to unhitch my trailer. I was spending the two nights I was in town at my sisters and being in town there isn't enough space to park my rig while visiting. Grateful to be able to leave it at Pamela's place while I was visiting my Sis and her hubby. Disclaimer here. This is my rig but not Pamela's place. But I imagine you all figured that out already. It has been a busy few days and there is still more to the story. Just wanted to check in today as I said I would last week before I left. Please stay tuned for the second installment on this adventure tomorrow night. Before I leave you all I wanted to give a shout out to my visitor from Clovis , CA . Don't know exactly where you are located but as a valley girl I spent a considerable amount of time in the Clovis area over the years. It was a treat to see a visitor from my hometown area thanks for stopping by hope to see you again. It is that wonderful time of the year again. Hay, hey or "Hey we need Hay!" So cause and effect September's first road trip in preparation. We are blessed with the most wonderful hay man. Brett of B and B Farms in the central San Joaquin valley of California. We have been purchasing hay from Brett since about 1991. He and his family have grown hay for 3 generations and Brett grows wonderful dairy quality hay. 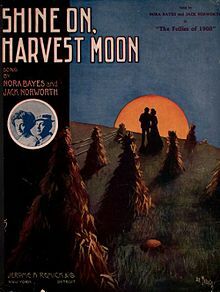 For those of you who don't know about hay here you go. Alfalfa hay which is higher in protein or "hotter" as we who grow hay or have dairy animals call it than other hays. It is usually the first through third cuttings that make the "cut" so to speak. Dairy producers like to see the test number hit around 53 to 55 percentage of TDN. TDN is total digestible nutrients and is usually made up of a fine stemmed leafy product. And Brett because he had been growing since he could walk is a master at this. So much so that this year the hay from his second cutting second year field was a thicker stem and yet my picky goats ate every last bit of it. Goats aren't big fans of thick stemmed hay. Goats picky? Don't goats eat everything? Sorry to burst the goat bubble but no they don't . The best way I can explain goat behavior is when there is something new to them they like every good toddler (even the adults) give it a good going over with their lips. They don't have opposing thumbs friends so that is the only way they can check it out. And on occasion it goes down the hatch. Not because they consider the object of their curiosity a food souce but because their lip smacking gets the best of them. In 31 years of goat keeping it has been my experience that unless a goat is starving they will stay pretty much to their regular diet. So much in fact I once had a Nubian doe that would dance through her grain bowl with her tongue and deliberately leave every piece of rolled corn in the bowl. Flag was not a big fan of corn apparently. So who is eating this wonderful hay on the farm? Well these two Libbie on the left and KC on the right. And that good looking boy to the right Cloves. Not to be forgotten are Sundance Kid aka Buddy (white buck) and Longfellow Buddy's Sire below. Longfellow is our first home grown buck to linear appraise 90 EVE with the American Dairy Goat Association. That score will get some explaining as we get more into goat life here on Walnetto Farm. Hay is a very important part of a ruminants diet. Alfalfa is important because alfalfa makes milk. We have worked very hard over the years to establish a breeding program that presents does who give a minimum of 6-8 pounds of milk a day as first freshing two year olds. 8 pounds being a gallon. We have met and exceeded that goal while maintaining a 4-6% butterfat level. We have had some very high producing does in protein, butterfat content and pounds of milk produced in the day. That being when we were on offical milk test through DHIA (Dairy Herd Improvement Association)and had several does make it to Breed Leader status for the LaMancha breed with awards from the American Dairy Goat Association. On the farm milk goes into just about everyone and everything. From the four legged kids to the orphan rabbits, barn cats, chickens, dogs , humans, cheese and soap. And we like our milk raw with never an illness linked to our raw milk consumption in 31 years. With that said you can see why we are very picky about hay quality here at the farm as there is a lot riding on good quality raw milk. We wish everyone an epic weekend resting from your daily labor in a way that makes you smile. And look forward to seeing you again on Wednesday when we return with lots of photos of our hay trip. Winner We Have A Winner!